Alexander Wolfheze is thus to be commended for defying this trend and producing a work which openly declares the anti-modern and anti-liberal spirit of Traditionalism and applies it to the temporal world, rather than focusing on esotericism alone. 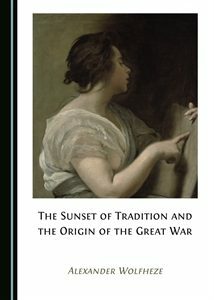 The Sunset of Tradition and the Origin of The Great War, fortunately, takes a large step towards rectifying the lack of original Traditionalist literature in English, being essentially a Traditionalist historiography – or, according to the author, only the start of a multi-volume Traditionalist historiography – of the birth of the postmodern world. According to the biography included in the book, Dr. Wolfheze is a Dutch scholar who specializes in Assyriology, cultural anthropology, pre-modern epistemology, and (naturally) Traditionalism, and he has previously published studies on Near Eastern cultural history. He is also active with the Dutch Right-wing metapolitical organization, Erkenbrand, so clearly, unlike most Traditionalist scholars, Dr. Wolfheze is not content to merely sit on the sidelines while his civilization is destroyed, justifying it by whining about “muh Kali Yuga.” While many Rightists pay lip service to Traditionalism without actually knowing much about it, Dr. Wolfheze seems to be one who is bridging that divide. I intend to write a more in-depth review of The Sunset of Tradition at a later time – my primary purpose in writing this brief announcement is to make readers aware of the book, and of the special price for which it is temporarily being offered, given its hefty cover price ordinarily. The book’s publisher, Cambridge Scholars, is offering the book at a half-price discount until December 1 as part of a commemoration of the Armistice, and information on how to get it can be found on their Website. For those who have found the Traditionalist perspective appealing, but who have longed for a more robust form of it which engages with real-world problems in a clear manner, this book is an important first step in this direction – and is thus for you. Published: November 25, 2018 | This entry was posted in North American New Right and tagged Alexander Wolfheze, Arthur C. Clarke, articles, book reviews, Childhood's End, First World War, John Morgan, modernity, North American New Right, originals, The Sunset of Tradition and the Origin of The Great War, Traditionalism. Both comments and trackbacks are currently closed. I was all set to buy this book, without delay. However, after reading the 30-page sample on the Cambridge Scholars website, I am now hesitant. Although the sample covers only the Preface and up to the sixth page of the Introduction, once other initial materials are paged through, my impression of Wolfheze’s writing is that it is sophomoric & overheated, sub-Nietzschean provocation. Good for an adrenalin rush, but does he offer real substance and analysis? I will probably buy it anyway, $60 price tag after FFW18 discount, as the book’s overall thesis and chapter headings sally & tally so closely with my own notions & concerns. I would not have reviewed the book positively if it was of that sort. Prefaces and introductions are often more general and less detailed than the bodies of books, and this one is no exception. It is certainly not a Nietzschean analysis. The main text of the book is a very dense, detailed, and specific analysis of events which mark the decline of Tradition in the West and set the stage for the First World War. I didn’t want to write a detailed examination of it until I had the chance to properly review and consider everything that’s in it, as it is quite rich with information and detail. I assume that you mean Sufism, a subject on which a considerable amount of Traditionalist literature was indeed produced. While I can understand why some folks might feel a degree of aversion to it, I would argue that Sufi tradition can be easily divorced from Islamic/Abrahamic trappings and that it is in line with Aryan ethos. In fact, good arguments have been made for its Indo-European sources. I have no problem with Islamic mysticism (I use that term deliberately, to include Shi’ite mysticism as well, which is not Sufism), or whites who study it, whatsoever. However, if you look at the bulk of Traditionalist literature in English that’s been published, putting aside the translations of works by its primary thinkers, it is overwhelmingly comprised of works related to Islam and Islamic mysticism. You will find very few that examine the Hindu, Buddhist, Taoist, Christian, or other traditions. The reason for this is clear: most Traditionalists who came after the first generation chose to follow Guénon and Schuon’s example and become Muslims, even though, as Prof. Mark Sedgwick pointed out in his history of Traditionalism, there is no particular reason why Islam should occupy a privileged position in Traditionalism. Guénon never suggested to anyone that they should become Muslim, and he rarely wrote about Islam in detail in his work. So, sure, let the works on Islamic mysticism continue, but it would be nice to also see a lot more Traditionalist works pertaining to other traditions, especially those which are more compatible with the Western spirit. Dr. Wolfheze’s work is part of that. Clarke thought that novel’s ending to be a happy one tho, did he not? And I imagine that some rightist of transhumanist and/or gnostic variety might see it that way. At the end of the novel it’s really up to the reader to decide if it’s a positive ending or not, and I’m not aware if Clarke somewhere spoke about how he saw it. However, certainly from a Traditionalist perspective it can only be seen as a catastrophic ending and as an inversion of the fact of devolution. I have to say that CC is a most valuable resource. When I read Greg’s ‘Remembering René Guénon’ I was struck by how Whites have been deprived of our history of our THINKERS and their writings. Let’s face it Counter Currents a jewel and whenever I remember to come here I end up spending hours, literally. René Guénon I will always remember him a man of incalculable worth. While Guénon offered valuable insights, I am of an opinion that he was unfortunately still too steeped in Abrahamic worldview. It is with Evola that authentically Indoeuropean Traditionalism begins. Can’t say I’ve been disappointed with any of the book recommendations from CC. Definitely will be getting a copy while it’s on sale, though.